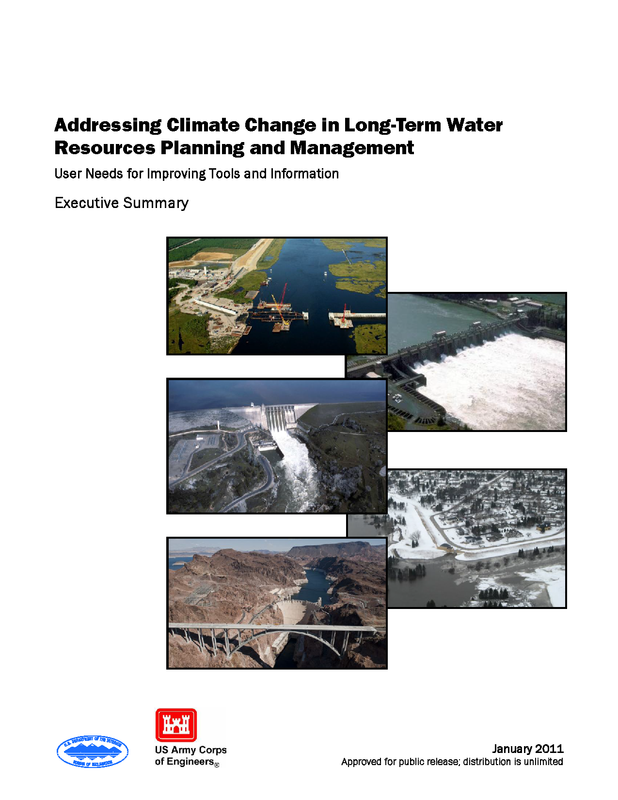 The U.S. Army Corps of Engineers and Bureau of Reclamation have published a report, "Addressing Climate Change in Long-Term Water Resources Planning and Management: User Needs for Improving Tools and Information," that identifies the needs of local, state, and federal water management agencies for climate change information and tools to support long-term planning. The report was sponsored by the Climate Change and Water Working Group and seeks to focus research and technology efforts to address information and tools needed for longer-term water resources planning and management. It found there were gaps in the information and tools to help water managers in how to use climate change information to make decisions, how to assess the responses of natural systems to climate change, and how to communicate the results and uncertainties of climate change assessments to decision-makers.